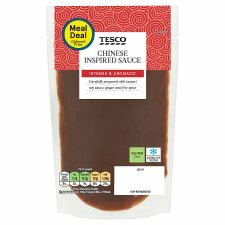 A stir fry sauce made with Tamari soy sauce, ginger purée and Chinese five spice. Intense & Aromatic Carefully prepared with tamari soy sauce, ginger and five spice. This product can contain small fibres which come from the ginger purée. INGREDIENTS: Water, Tamari Soy Sauce (7%) [Water, Soya Bean, Salt, Spirit Vinegar, Alcohol], Ginger Purée (6%), White Wine Vinegar, Garlic Purée, Sugar, Yellow Bean Paste [Yellow Soya Bean, Sugar, Water, Salt, Spirit Vinegar, Soya Bean, Alcohol], Cornflour, Rapeseed Oil, Chinese Five Spice [Cassia Powder, Fennel Powder, Ginger Powder, Star Anise, Clove Powder], Caramelised Sugar Syrup. Defrost thoroughly for a minimum of 12 hours in the fridge. Once defrosted, do not refreeze. WOK 1 min Add the sauce to the wok, with your already cooked stir fry mix and stir fry for 1 minute.